FILE - Russian Foreign Minister Sergey Lavrov gestures during a meeting with South Korean head of National Security Chung Eui-yong at the Russian Foreign Ministry in Moscow, March 13, 2018. Russian Foreign Minister Sergei Lavrov said Tuesday his government will respond to a U.S. order for 60 Russian diplomats accused of being spies to leave the United States within a week. Twenty-two other countries, including France, Germany and Poland, have also expelled a total of 77 Russian "intelligence personnel," according to the White House. That list does not include Australia, which announced [Tuesday] it is expelling two "undeclared intelligence officials." Lavrov blamed the mass expulsions on "colossal pressure" by the United States. A taxi in front of the Russian Embassy in Warsaw, Poland, March 26, 2018. The U.S. move, along with the closure of a Russian consulate in the country, is in response to Moscow’s to what the State Department called the "outrageous violation of the Chemical Weapons Convention and breach of international law," involving the nerve agent attack on a former Russian double agent and his daughter in Britain. Britain, other Western nations and NATO also blame Russia for the March 4 chemical attack in Salisbury. Moscow denies involvement and has accused "powerful forces" in the U.S. and Britain as being behind the attack. Russia has been sounding "a drum beat of destabilizing and aggressive actions," said a senior U.S. official, explaining the White House actions. The United States is ordering the closure, by April 2, of Russia’s consulate in the Pacific port city of Seattle in the state of Washington, noting its close proximity to the Boeing aircraft plant and the Kitsap Naval Base, the home port for some ballistic nuclear missile submarines. 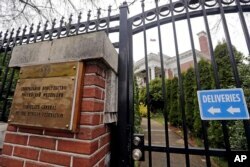 A metal fence surrounds the residence of Russia's consul general Monday, March 26, 2018, in Seattle. The consulate is "part of this broader problem of an unacceptably high number of Russian operatives in the United States and "we are prepared to take additional steps, if necessary," a senior administration official told reporters shortly before Monday’s announcement. President Donald Trump, who spoke with Russian President Vladimir Putin last Tuesday, has been involved in the discussions to expel the diplomats, according to officials. "This is absolutely his decision," emphasized a senior U.S. official in the call with reporters. "The president spoke with many foreign leaders, our European allies and others, and encouraged them to join the United States in this announcement," White House Deputy Press Secretary Raj Shah told reporters. He added the action is "significant in degrading their intelligence capabilities around the world, not just in the United States." Shah repeatedly stated the Trump administration stands ready to build a better relationship with Russia, "but this can only happen with a change in the Russian government’s behavior." Some, however, want Trump, considered by his critics to be too soft on Russia, to take a more assertive public role. The top Democratic Party member on the House Foreign Affairs Committee, Eliot Engel, says Monday’s strong U.S. response to the attack "makes even more bizarre the administration's weak response to Russia's ongoing attack right here in the United States." He says the administration needs "to stand up for our own democracy." Republican Senator John McCain says that while Trump’s decision "sends an important signal to Moscow, the only way to ensure Putin and his cronies feel the consequences of their brazen actions is by punishing them financially." Former U.S. ambassador to Russia, Alexander Vershbow, an Atlantic Council distinguished fellow, agrees, telling VOA: "Russian fingerprints were clearly on this attack, and a stiff response was necessary. I personally think an even tougher response is still justified, including some of the targeted sanctions on the big oligarchs that are close to Putin to show that those who support a system that sponsors aggression of this kind will pay an increasing price, if this keeps going." The expulsion order covers 48 Russians at embassies and consulates in the United States and 12 assigned to Moscow’s mission at the United Nations in New York City who "abused their privilege of residence," according to a senior U.S. official. "When we see these espionage tactics that are taking place right here at the heart of the U.N. we can’t have that," U.S. Ambassador to the U.N. Nikki Haley told reporters. "This is really not just us, but multiple countries saying all these actions have to stop." All those being expelled are considered spies who "hide behind the veneer of diplomatic immunity while engaging in espionage activities," according to a senior administration official. If Russia retaliates against the United States for the expulsions, Washington could take further action, according to a senior U.S. official, hinting that some of the dozens of other suspected Russian spies allowed to remain in the country could also face banishment. Former spy Sergei Skripal and his daughter, Yulia, were found unconscious on a Salisbury park bench. They remain hospitalized in serious condition. 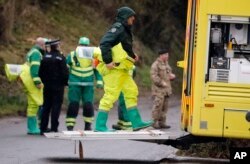 FILE - Military forces work on a van in Winterslow, England, March 12, 2018, as investigations continue into the nerve-agent poisoning of Russian ex-spy Sergei Skripal and his daughter, Yulia, in Salisbury, England, on March 4,2018. "We assess that more than 130 people in Salisbury could have been potentially exposed to this nerve agent," British Prime Minister Theresa May said in a statement delivered Monday to parliament. Stephen Fortescue, an honorary associate professor at the University of New South Wales in Russian politics and economics, told VOA he thinks Russia was responsible for the attack and that it was meant to serve as a message to current and potential defectors that the government could get to them at any time. "My guess is that the Russians, if they did it, probably didn’t expect this sort of coordinated response," Fortescue said. Margaret Besheer at the UN; VOA Russian Service, Victor Beattie contributed to this report.